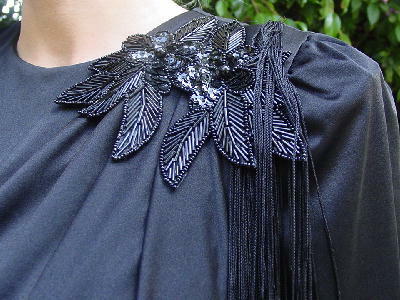 This vintage black synthetic dress has thin net shoulder pads, long sleeves, and gathering at the shoulder-sleeve seam. There is a jewel neckline, back 19 3/4" long zipper, and it was made in the USA by After Dark. The front has an angled fabric panel which is attached across the top and right side seam, and it flows freely in the front (from below the left shoulder top seam). The upper left front has two black sequins and beaded appliques. It has thin 8" long fringes along the front angled panel and horizontally along the lower bottom and also along the hemline, which gives the dress lots of movement - perfect for dancing. 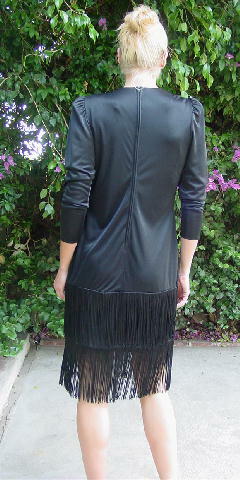 shoulder to bottom fringe 42 3/4"
shoulder to bottom hem (without fringe) 35"